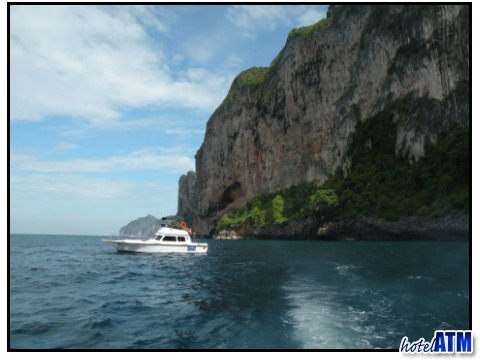 During December to January you will traditionally get the best weather on Phi Phi Island and this article describes a trip to Phi Phi Island during that period and refers to the weather on other days and other periods. The Hotels and resort promote their highest room rates during the best weather on Phi Phi. This is the one time when you can get cooler dry air from the Asian continent sinking down over southern Thailand and so typically the the days are dry with 31-34 degrees C in the day and 22-26 degrees C at night. You will often get clear skies and starry nights. However the weather on Phi Phi was quite different this year with the low season rains going on patchily, mixed in with sun until mid December. This had 2 effects for Phi Phi, one was that the vegetation, which sometimes starts to brown by December was still a vibrant and lush green and the water supplies were very plentiful. The dry clear weather seems to have moved till the first week in January. This leads to an interesting situation for those Phi Phi Visitors who are coming in years ahead who are flexible with time. If you can delay arrival till after Christmas you will get better weather and if you delay till after 20th January you will get your accommodation without the Peak Season surcharge. Weather can be dry in May and with low season prices being 40-50 % cheaper before any deals it can be a very effective time to visit. 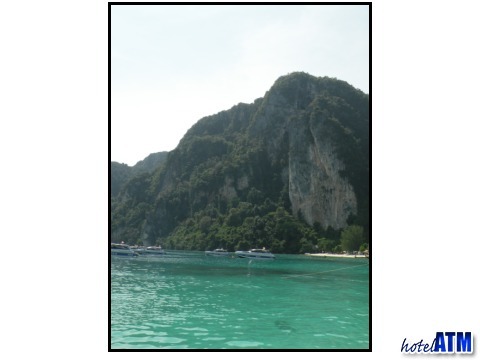 I did a recent tour in December 2010 with friends and on Phi Phi Ley. We went by speed boat. The weather was over cast with a thin layer of cloud, the sea calm... the day before had been perfect blue skies. We travelled around the back or west side of Phi Phi Ley. Out along the Palong wall we jumped over the side on the opposite side to the Viking Cave and spotted quite a few black tip reef shark at some depth (10-15 meters). As the light from the cloudy day was not strong it was more difficult to see and so it was difficult to tell the shark size but I saw them even with more poor sight so I suppose they were over 1 meter, maybe 1.5m. Our speedboat driver Khun Nui, then took us to 2 new places on the island...firstly the only waterfall on Phi Phi Ley, a stream of water that the local bird nest soup farmers use for water. At that moment I looked up and saw Elvis Rock a place that a Diving buddies have talked about for years but I had never found. Maya Bay was busy when we got there so went to the northern beach which we had to ourselves. The sun broke through the clouds and the tide was up which made some beautiful snorkeling conditions in the shallows. Maya Bay was pure magic and the Princess of Thailand was visiting so their was a large and splendid motor yacht moored just outside the bay. I took the teenage kids around the small headland to one of my favourite snorkel spots and we were lucky. This time and at depth but as sure as you like, we swam with a turtle for 2 minutes as it rounded a boulder the size of a house. My Phillippine friends left on the 2.30pm ferry back to Phuket. They had a great time and feel the Peak Season Weather and the trip had done justice to the beauty of Phi Phi. A good link to check out what's going on now is the Phi Phi Weather page which also has the live radar for showing rain showers etc. Our Koh Phi Phi Travel Experts have hand-selected the best of the best hotels and resorts across several categories.